The California Department of Public Health routinely publishes a list of fines to hospitals which have made egregious errors that caused the death or permanent injuries to patients when the proper safety protocols are not followed. The fines can range up to hundreds of thousands of dollars for facilities with multiple recurring mistakes. The state conveniently publishes the results of their findings so that others might learn from the mistakes of others. This month the list includes twelve hospitals. Many are the "routine" so called never errors like leaving a lap sponge inside a patient during surgery. However I'd like to highlight one particular case that I thought was very instructive. The case involves one of our local SoCal hospitals: Kaiser Foundation Hospital of Harbor City. According to the report, the patient was admitted to the hospital in 2010 for hematemesis. A nurse reported the patient vomited bright red clots of blood. After the patient was intubated in the ICU, she was taken emergently to the operating room. During the procedure the surgeon noted that the patient was coagulopathic. He requested Factor VII be given to help clotting. The CRNA in the case told the state investigator that he gave a drug that was given to him by the supervising anesthesiologist without ever confirming its contents because he "put his trust in [my] supervisor and took the bottle of medication" and pushed it into the patient. The patient made it out of the OR but continued to bleed profusely. When the surgeon asked for more Factor VII to be given in the ICU, the pharmacist said he had not sent any to the patient. He had sent Activase instead. Activase actually prevents blood from clotting and is used to treat patients with blood clots causing an ischemic stroke or heart attack. When interviewed by the investigators, the circulating nurse in the OR said he had written down Activase on a piece of paper when the surgeon made the Factor VII request. When the drug arrived to the OR, he repeated "Activase" three times to the surgeon. The anesthesiologist in the room said he heard the surgeon call out for Factor VII but admitted that he never looked at the medication he was given by the nurse before giving it to the CRNA. He concedes that the protocol is to confirm the identity of every drug by reading its label before administering it to the patient. The patient eventually died later that day. The cause of death was listed as "periprocedural administration of alteplase". (the generic name for Activase) As usual, when a catastrophic error occurs, it is not a single mistake that happens but a series of chain reactions. The surgeon said he asked for Factor VII, which was confirmed by the anesthesiologist. The nurse said he heard Activase and confirmed three times with the surgeon. The nurse gave the drug to the anesthesiologist who did not read the label because he either put his complete faith in the circulating nurse and pharmacy or he was too busy with a critically ill patient. He drew up the drug and gave it to the CRNA who did not look at the drug label either because he he never questions his supervising anesthesiologist. And the patient died as a result of all the mistakes committed by several different people. Though it's tough to air your dirty laundry in public, this is how medicine polices itself. Though Kaiser was fined by the state for $50,000, hopefully this will be a small price to pay to ensure that other hospitals won't make the same missteps and tragic outcomes. Anesthesiologists don't always get the special attention we feel we deserve. Unlike the surgeons who get the most advanced laparoscopic equipment or the internist who has access to the latest antibiotics or antihypertensives, anesthesiologists are usually relegated to equipment so old it would make a used car salesman blush. I have seen anesthesia ventilators that are still in use even though they were purchased when Elton John was still considered heterosexual. But perhaps there is a reason for that. You see, we anesthesiologists don't really have a personal stake in the equipment that we use. The anesthesia machines are paid for by the hospital. So are our offices. Unlike other doctors who have to pay rent and take care of their own office equipment, some of us are not as caring that comes from personally paying for things out of our own pockets. I can't tell you how often the anesthesia machines are banged up and scratched. Or the laryngoscope handles get accidentally tossed out in the trash. But here are just two recent examples in our hospital of anesthesiologists who don't give a s*** because, well, they didn't pay for it. 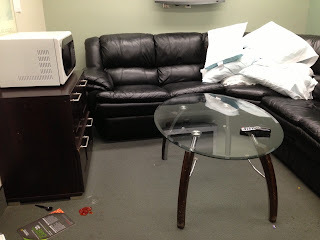 Here is a picture of our anesthesia lounge recently. It is not a pretty sight. Somebody decided to take a nap on the sofa and brought some hospital pillows and blankets with them to make it more comfortable. Unfortunately he, most likely a he, did not bother to take them away when he was finished and just piled it up in a big heap. I guess his mother never taught him to make his bed and clean his room when he was growing up. And what's this stuff on the floor? Why it's cherry flavored hospital jello that somebody, don't know if it's the same person, brought to the lounge to eat and decided he didn't want it. Instead of finding a trash can to throw his food away, it got dumped on the carpet. Classy. 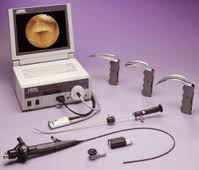 Another disgusting example is this picture of our damaged video laryngoscopy equipment. These things cost thousands of dollars. However they are worth every penny as a difficult intubation can usually be completed with one of these technological wonders. However, some people in our group didn't feel the need to maintain the equipment so that other people might be able to use it. 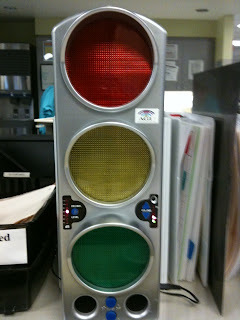 As you can see, our group is lucky enough to have several of these in use, and two of them have been damaged. The screens have been cracked and will require several thousand dollars to repair. You wouldn't see an anesthesiologists treat their personal iPads with such cavalier attitudes. For comparison, here is what a new one looks like. Maybe there is some justification for making anesthesiologists use old outdated equipment. Many have not demonstrated the maturity or the responsibility to handle new things. So now the rest of us will have to make do because of the childish behaviors of a few. Q: How Does A Doctor Make Money In California? A: You Can't. The wise judges of the 9th Circuit U.S. Court of Appeals in San Francisco has decided that the state of California was within its rights to cut Medi-Cal reimbursements to physicians by ten percent. Medi-Cal is California's version of the federal Medicaid health insurance for the poor. The state first passed a bill, AB97, in the summer of 2011 to lower physician payments in an attempt to balance its woefully indebted budget. The bill would have allowed Medi-Cal to pay just $11 per office visit and $100/day to hospitals for inpatient care. Hospitals and doctors' groups immediately sued to stop the bill. An injunction against its implementation was placed on it until now. According to the appellate judges, "prior to reducing rates states need not follow any specific procedural steps, such as considering providers' costs..." To add insult to injury, the judges further point out that, "Neither the state nor the federal government 'promised, explicitly or implicitly' that provider reimbursement rates would never change." Hmm. So the state doesn't have to consider the costs of providing a service when it decides how much it is willing to pay for the service. And even when it does, it can change it at will without input from the people who has to provide the service. Doesn't sound like much of a business case for doctors. The state argues that with the expansion of Medi-Cal due to ObamaCare, doctors here will at least be reimbursed for treating patients that previously were uninsured and uncollectable, even if the payments are very low. That sounds like a version of the old business joke where a store owner loses money on every sale but he'll make up for it with volume. The bottom line just doesn't work out. It's no wonder most doctors in this state refuse to accept any more Medi-Cal patients. California has said that it will monitor the ability of Medi-Cal patients to get physician access. If the state feels that its patients are not able to find doctors willing to take Medi-Cal, it will "take immediate action." Does that mean it will raise reimbursement rates to attract more doctors into the program? Hardly. There is talk that the government may obligate California physicians to accept a certain percentage of their patients from Medi-Cal as a condition for licensure. In other words, indentured servitude. If California really is the trendsetter for the country, we are witnessing the implications of ObamaCare in microcosm. The California state government has helpfully provided a list of Medi-Cal reimbursements for all procedures listed by CPT codes. If you're contemplating on moving to the once Golden State, it may be worthwhile for you to spend a few minutes looking at it to see how it may impact your income if you decide to move to the land of low payments, exorbitant taxes, and onerous business rules. Also remember that these rates are subject to an immediate ten percent cut due to AB97 and more cuts in the future whenever the politicians feel like it. When I left for work before 6:00 AM this morning, I saw this gorgeous image that literally had me stop my car in the middle of the road. Don't worry. It was our neighborhood street with no cars traveling at that ungodly hour. 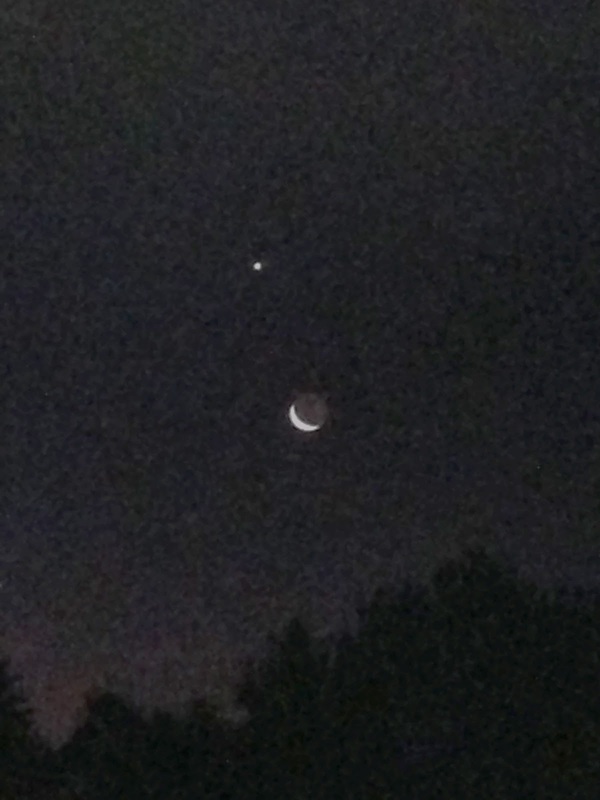 It is the image of a very thin crescent moon hanging over the eastern horizon. Right above it is Venus, rivaling the moon in its brightness. Below the moon, closer to the horizon and just off the side of the picture, stood Mercury. You can see a little bit of the horizon on the bottom of the picture to give you a perspective. I quickly whipped out my cell phone and snapped a picture but it really doesn't do the scene justice. To the naked eye the moon appeared much bigger being so low on the horizon. The earth's reflected light on the dark side of the moon was intensely bright to the point that I could almost make out the different craters and seas on its surface. Little can be said for leaving for work so early every day. But sometimes, you get to see amazing images that all but disappear by the time most people wake up for their first cup of coffee. In the spirit of expensive medical devices with questionable patient benefits, our hospital recently installed the Yacker Tracker in our recovery rooms. Many studies have linked a noisy environment with poor patient satisfaction and outcomes. We've all been in the ICU where alarms are going off nonstop throughout the entire ward. It drives us insane just being there for five minutes. Pity the poor patient who's stuck in his bed for weeks at a time while the alarms are blaring all around him. 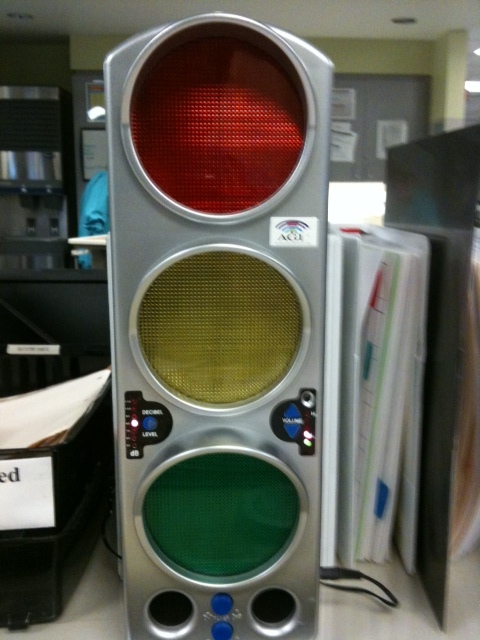 In response to patients and families complaining about our recovery room being too noisy, the hospital has decided that we need the Yacker Tracker to tell us when to pipe down and stop gossiping about what so and so did at happy hour last Saturday night. It works best for noise that is sharp and loud, like a book dropped directly in front of it. It doesn't seem to work as well for the ambient noise that is more prevalent in in the recovery room. Several people were talking near the machine in a normal conversational tone and not a peep came out of it. In fact I did my best Gangnam Style impersonation directly at the device and it didn't alarm. Oh well. It seems like a nice idea in trying to raise the ever more important patient satisfaction score. Surfing In The O.R.? Go Ahead. It's Okay. Surgeons routinely complain that anesthesiologists aren't working hard enough. Whenever they peer over the ether screen, they see the anesthesiologist reading a book or newspaper, or more likely nowadays, surfing the internet. I've seen surgeons call up the O.R. director over their irritation with their anesthesiologist's inattentiveness to the patient. Well now we have a study which says that distracted anesthesiologists may not be such a bad thing. Answering a question that many people have been wanting to know, David Wax, M.D., et. al. at Mount Sinai School of Medicine in New York has published a study in the December 2012 issue of Anesthesiology that looks at the consequences of anesthesiologists who are busy looking at the internet and not at their patients. In their study of 1,061 cases by 171 clinicians (anesthesiologists, residents, and CRNA's), they found that there was no correlation between how long somebody was using the computer to do something else besides charting the patients' anesthesia record and any hemodynamic instability in the patient. The results show that there were no differences in the rates of hypertension, hypotension, or tachycardia between the times spent on the computer for anesthesia record keeping vs. times not doing so. Zero. Nada. They could accomplish this because the anesthesia workstations had internet access and were able to track what the clinicians was doing with the computer at that time (hello Big Brother). The researchers found that the clinician was more likely to be using the computer for non patient use if he was an attending anesthesiologist working alone in the room, the patient had a lower ASA score, the case lasted a longer period of time, and the patient was given general anesthesia. For cases lasting less than one hour, the median time not used for record keeping was only one percent of the total case time. In cases that went on for 1-4 hours, the amount of time on the computer not used for the patient stretched to 21%. In a four hour case that would work out to 48 minutes of surfing time. For cases taking longer that four hours, a median of 29% of the time was being used for something else. A five hour case would presumably mean the anesthesiologist was not monitoring the patient for 87 minutes. Overall, a median 16 minutes of time was spent on non anesthesia related work on the computer over the course of a median 80 minute procedure. There are some weaknesses in this study. The authors were not able to distinguish between the computer user surfing the net for pleasure or using the workstation to look up a patient's labwork. They of course also couldn't tell if the clinician was busy using his own tablet or smartphone to surf the net instead of using the workstation. In an interesting editorial, Drs. Karen Domino and Daniel Sessler compare the anesthetic experience to driving a car on a long boring stretch of road. Keeping your eyes fixed on the road soon lead to fatigue and boredom. Sometimes the brain needs some distractions to maintain its vigilance. They note that previous studies have shown that anesthesiologists spend less than 5% of their time actually looking at their patient's computer monitor. Only about 25% of an anesthesiologist's total time in the operating room is actually devoted to monitoring the patient. The rest of the anesthesiologist's time is presumably taken up moving the O.R. table up and down per surgeon's request, changing the radio station to the surgeon's preference, or turning down the thermostat to freezing so the surgeon feels comfortable. Though this study shows that not staring at a patient's monitor every second in the O.R. isn't the sin it's been construed to be, if you ever get into a malpractice suit for not paying attention to the patient crashing on you, you'll pay for it. In the Anesthesiologists' Closed Claims database, thirteen claims of injury due to a distracted anesthesiologist have been filed. In 91% of the cases, the care was judged to be substandard. In 83% of the cases, money was paid to the plaintiffs at a median payout of $725,937. Ouch. So doctors, surf the net in the O.R. at your peril. While this study says it is unlikely anything untoward will happen while you're looking up MarketWatch, if your patient crashes and burns, you and your malpractice insurance company will be paying for the transgression dearly. Want To Be An Anesthesiologist? Only Perfectionists Need To Apply. One of the toughest things about being an anesthesiologist is that we are always striving to give the perfect anesthesia. I guess you could call us the Goldilocks of the operating room. You never want to do too little or too much for the patient. If your practice deviates to either extreme, you will be doing your patients a disservice. Let me give you some examples. First, let's take general anesthesia. It is considered one of the most important developments in the history of medicine. Yet despite over a century of use, its application can still be extremely challenging. While modern anesthesia machines are leaps ahead of the old copper kettle, it still harder to use than a toaster. It still takes years of training and experience to judge just the right level of anesthesia to give. If you allow too little anesthesia, you'll be hearing from the patient's lawyers about how the patient suffered surgical recall and remembered feeling every slice of the scalpel on her body while she was totally paralyzed. Give too much anesthesia and the patient's blood pressure could bottom out, causing a heart attack or a stroke. It is not an easy balance to maintain during the course of an operation. How about pain control? We anesthesiologists are considered experts at relieving pain since, well, we invented the field way back when. But it is no easier now than a hundred years ago to give just the right dose of analgesics to make the patient comfortable. Every patient has a unique level of pain tolerance that no computer model can replicate. We have all experienced the anxiety of having a patient screaming in pain in the recovery room despite having been given twelve milligrams of hydromorphone in the past one hour. At the opposite extreme you might give a patient half a milligram of hydromorphone and suddenly the patient goes apneic and you're calling for the Ambu bag and a bolus of naloxone. Pain management is tricky as hell to do perfectly but that is often what is required of anesthesiologists. Let's not forget the complex business of blood transfusions. In this age of scarce blood supplies and possible viral transmissions, it is vital that just the right amount of blood be given to a patient. We are always trying to keep the patient's hematocrit around thirty for the best combination of oxygen carrying capacity and blood viscosity. We do this even though we may be giving the patient liters of crystalloid fluids while the surgeon is losing hundreds of cc's of blood at the same time. If we transfuse too little blood the patient could die from hemorrhage or end organ failure. Give too much blood and the hospital starts questioning you on the waste of this precious resource. Transfusing blood products is not to be taken lightly. These are just a few examples of why anesthesiologists need to be perfectionists. There is little room in this field for approximations. Unlike internists who can keep adding antihypertensives to a patient until the blood pressure is just right, we usually have only one shot at doing right by the patient. We don't have days or weeks to fine tune our treatment plan. Surprisingly we are successful more often than not. It is not often that I go home at night and worry myself sick over what I could have done differently. Of course there are always cases where I ruminate for hours on the what ifs of a particular case. But these are the exceptions, not the rule. So if your idea of practicing medicine is to sit in the doctor's lounge, drink coffee, and munch on a Krispy Kreme while discussing patient histories with your fellow physicians for hours on end, anesthesiology is probably not for you. We like our colleague fast thinking, resolute, and faultless. Because our patients demand nothing less than that from us.